Saad Hariri’s unexpected resignation in Riyadh fueled speculation in Lebanon over whether its prime minister was a captive of his Saudi patrons and his speech was coerced. Locked in a regional struggle with Iran, Saudi Arabia came to see Hariri as a “fig leaf” for Tehran-backed Hezbollah, which sits in the national unity government, says Mohamad Bazzi, a journalist and professor at New York University. But, Bazzi says, there is a possibility for this crisis to be defused if Hezbollah withholds support for Houthi rebels in Yemen. What does Saudi Arabia gain by taking Hariri out of the government? It is part of a larger strategy to corner Hezbollah. Saudi Arabia had invested years and tens of millions of dollars in Hariri, his political movement, and his allies. 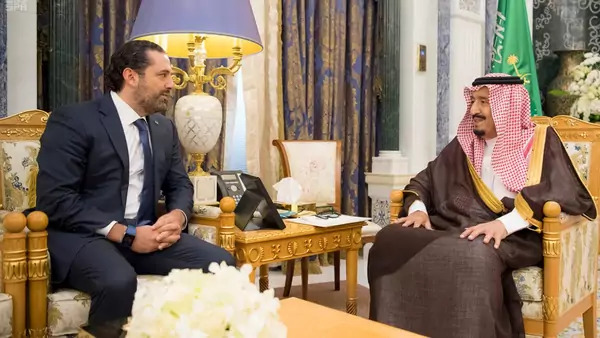 But there’s a perception in Riyadh that Hariri can’t quite deal with the combination of Hezbollah and the Lebanese president, Michel Aoun, and that perhaps [Saad’s] older brother, Bahaa, would be tougher. There’s speculation in Beirut that the Saudis were trying to push Saad Hariri aside and elevate Bahaa to the leadership of the [predominantly Sunni political party] Future Movement and the Sunni community in Lebanon, and maybe even offer his older brother as a candidate for prime minister. It seems that Saudi Arabia’s power play backfired. But it was done without consulting any of the stakeholders in the Sunni community in Lebanon, and it seems it was done without consulting the leadership of the Future Movement or even members of the Hariri family. In that way, it seems that Saudi Arabia’s power play backfired. Hariri has strong ties to the Sunni Arab states and to the West. Because he’s in a national unity cabinet in which Hezbollah and its allies—mainly Aoun and his party—are the dominant forces, he became, in the Saudi view, a fig leaf for Hezbollah. The Saudi leadership figured that they would push Hariri out of the way, withdraw political cover from Hezbollah, and make it easier for the West to isolate Hezbollah. That also hasn’t worked out. Is Hezbollah truly an Iranian proxy, as Saudi Arabia argues, or does it pursue its own agenda on behalf of Lebanon’s Shias? Hezbollah has probably become the most successful foreign policy project of the Islamic Revolution. Over the past few years it has devoted enormous resources and energy to an Iranian priority, the preservation of Bashar al-Assad’s regime. That Iranian priority mostly coincides with Hezbollah’s priorities when it comes to Syria, but I’m not sure if at the beginning of the Syrian war Hezbollah expected to be involved for this long and to devote this much energy and manpower to it. Hezbollah has probably become the most successful foreign policy project of the Islamic Revolution; it is the most successful group that Iran has funded and nurtured over the years. Could Saudi pressure compel Hezbollah to bow out of regional conflicts? On the face of it, no, although Hariri granted a TV interview to a Lebanese journalist on Sunday night in which he seemed to change the Saudi demands: instead of a total curtailing of Hezbollah’s role in Syria and Iraq and Yemen, he focused on the Saudi demand that Hezbollah should not support the Houthis in Yemen. That’s one demand that Hezbollah might meet. It’s not clear how much Hezbollah has invested in Yemen. In the past week, Hezbollah has tried to take a conciliatory tone by not attacking Hariri or his movement and by saying that Hariri is not in control of his situation, laying the blame on Saudi Arabia. The day after Hariri’s resignation, Hezbollah’s leader, Hassan Nasrallah, gave his own televised speech. He urged calm and was quite conciliatory to Hariri and his movement. That showed Hezbollah playing the game one or two steps ahead, trying not to inflame the situation. Saudi Arabia accused Hezbollah and Iran’s Revolutionary Guard Corps of firing a missile from Yemen that approached Riyadh, calling it an “act of war,” two days before Hariri’s resignation. Is it plausible that those groups, rather than the local Houthi militia, were responsible? It’s possible that Hezbollah’s and the Revolutionary Guard’s operatives are playing a logistical role in Yemen; they could have had their fingers on the trigger of a missile launch. But the Houthis are perfectly capable of doing that on their own, so some of the Saudi allegations seem exaggerated. One Saudi accusation after Hariri resigned was that Hezbollah was sending weapons from Lebanon to Yemen; that’s a roundabout way to get weapons to Yemen. It’s also possible the missile was acquired when Ali Abdullah Saleh was [Yemen’s] president; the Houthis have had an alliance with Saleh and elements of the Yemeni military have been loyal to him since the start of the Saudi war [in 2015]. It’s also possible that that missile was among the stockpile that was purchased from North Korea [by the Yemeni government prior to the current conflict]. Are developments in Syria germane to Saudi Arabia’s moves in Lebanon? Saudi Arabia and the Sunni Arab states realize that Assad has essentially won the war in Syria. He may never recapture the entire country, but he’s been able to hang onto power and consolidate his gains thanks to support from Russia, Iran, Hezbollah, and all of the Shia militias that were recruited for him, mostly by Iran. We’ve seen dwindling Saudi and other Sunni Arab support for various rebel and opposition factions in Syria, and there might be a temptation for Saudi Arabia to try to contain Iranian influence elsewhere in the region, and so Lebanon becomes a target. How do you think this confrontation will play out? The most likely scenario is an economic blockade against Lebanon, similar to the economic blockade against Qatar. The most likely scenario is an economic blockade against Lebanon, similar to the economic blockade against Qatar. This could involve the large-scale firing of Lebanese expats in Saudi Arabia, the United Arab Emirates, and some of the other Gulf countries. Economically it would be devastating for Lebanon if the remittances sent by workers in Gulf countries dry up. There’s not a large distinction between how these means would affect Hezbollah and its supporters and how they would damage the rest of Lebanon. There’s an element of collective punishment and isolation that would be damaging to the Saudis’ own allies in Lebanon. Could Hezbollah itself withstand that sort of economic punishment? U.S. Secretary of State Rex Tillerson put out a statement calling on parties to “respect the integrity and independence of Lebanon’s legitimate national institutions,” but elsewhere the Trump administration has called for a tougher line on Iran’s regional ambitions. The blank check that Saudi Arabia seems to have gotten from President Trump and other members of his administration isn’t helping deescalate the situation. Saudi leaders, at least at the beginning of this, seemed to think that they would have total U.S. support. Secretary Tillerson’s statement may have scaled back some of those Saudi expectations because it called on everyone to protect Lebanese sovereignty. But one potential reading in Riyadh is that Tillerson doesn’t have much impact on U.S. policy because he’s often contradicted by Trump. Most of the public statements we’ve seen from Trump show unequivocal U.S. support for Saudi Arabia. That has emboldened King Salman and his son. They see Trump squarely in their corner. What will you be looking for in the coming days or weeks? The next marker in this crisis will be whether Hariri returns to Lebanon, and, if he does, whether he sticks to his resignation. He might suspend it or withdraw it to try to negotiate a new kind of political arrangement with Hezbollah and with President Aoun. If he engages in a new round of dialogue with Hezbollah and its allies, it would show everyone stepping back from the brink. What would be on the table then? Hariri’s interview in Riyadh showed that Hezbollah’s involvement in Yemen is a red line for Saudi Arabia, and [exiting that conflict] might be the most concrete concession he can gain. We may not see a public acknowledgement of that concession because, while Hezbollah is public about its role in Syria, it is not about its roles in Iraq and Yemen. If it happens, that might assuage some Saudi concerns.